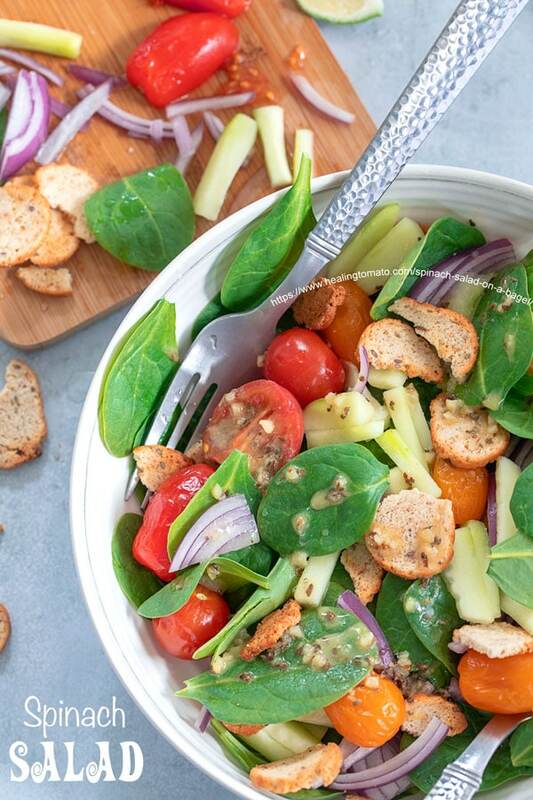 A Simple Healthy Spinach Salad with bagel chips. Make this for a Light Vegan Lunch or a Side Dish. Did you know that March 26th is National Spinach Day? How did I not know about it until a couple days ago??? Spinach is my favorite green veggie and so, I feel really dumb for not knowing about the one day dedicated to it. If you can, use organic spinach for this salad. If possible, don’t peel the skin from the cucumber. 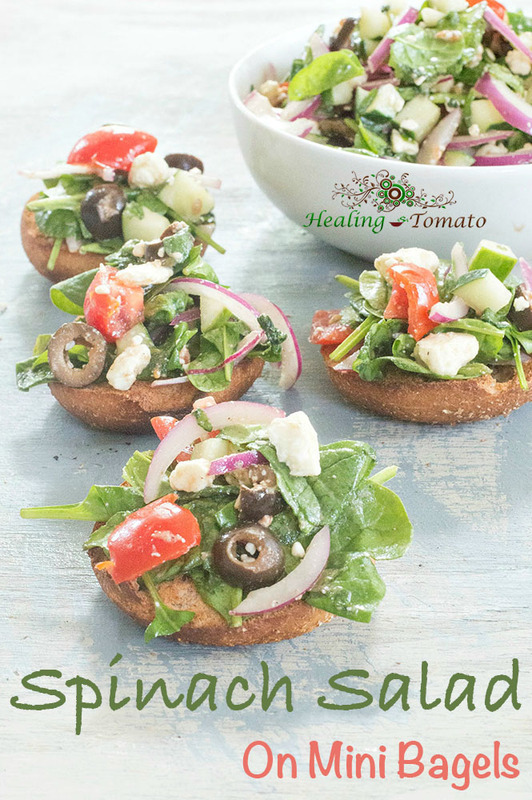 When I first made this salad back in 2016, I used the spinach salad as a bagel topping and it was so delicious!! I think I ate this salad combination everyday for the next 6 months. That’s how much I was obsessed. Eating all that spinach also did WONDERS for my skin. Since I have suffered from acne for most of my life, I was always looking for natural skin care options. But, even I had no idea how much spinach would help my skin. So, I think adding spinach to my regular diet helped my health in many ways. To this day, spinach is always my go-to recipe when I feel like my skin is dull, dry and acne prone. What Dressing Goes With Spinach Salad? Yes, my spinach salad recipe is low carb because I am using all veggies and natural ingredients. Use low Carb Bagel Chips like (NOT an affiliate link) Dixie Diner’s Club Low Carb Bagel Chips. This recipe was originally posted on August 1st, 2016 at 1:19pm. See the original recipe here. 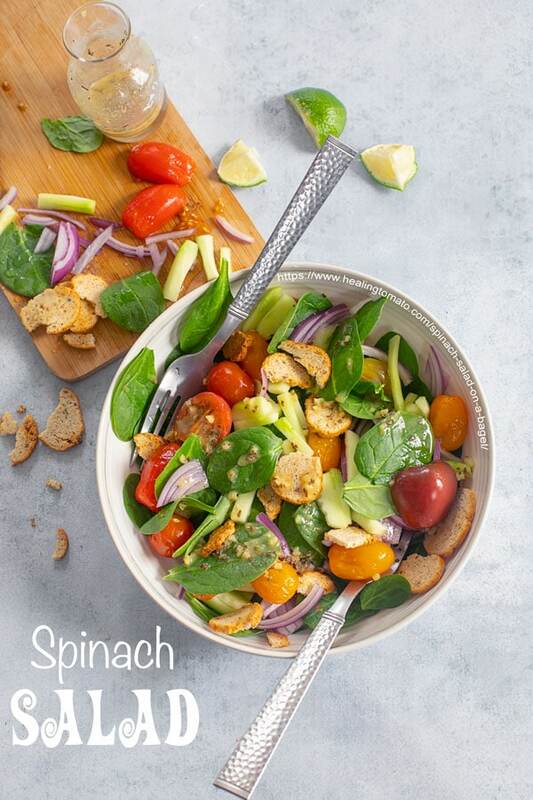 Over the years, I have made minor tweaks and URL changes to this spinach salad recipe. However, this time, I modified most of the recipe based on some of the feedback I heard from all of you. Most of you noted that its hard to bite into this sandwich without making a mess. Since many of you take it to lunch, they find it a little embarrassing to eat this salad. 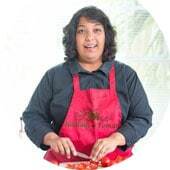 So, I want you to know that I heard you and made changes to this recipe. First, you can still use mini bagels. Sandwich the salad between two halves of the mini bagel. 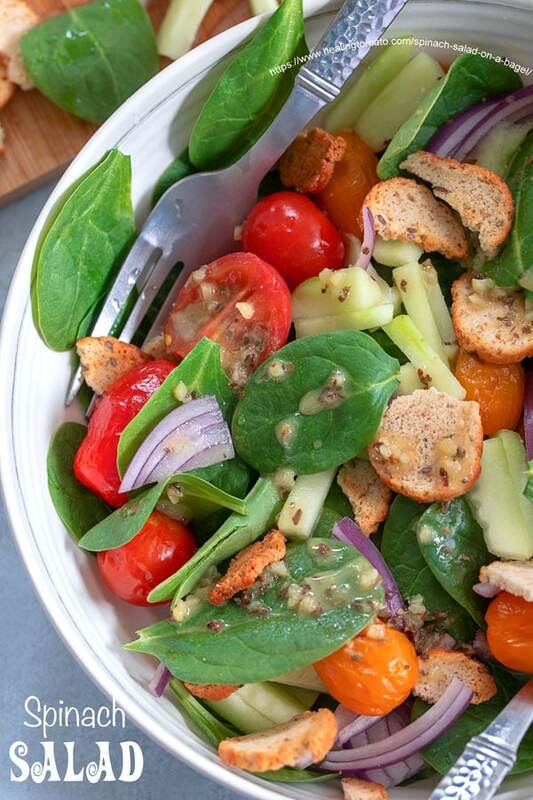 If you made this spinach salad recipe, be sure to rate it below. If you are using feta cheese, use regular black olives instead. Add the bagel chips and top with the dressing. If you have leftover bagel chips, you can use them to dip in 5 cheese dips or use them as base for canapes. I absolutely love this idea!! I can easily see this as a party dish! Oh my. To me that is a perfect lunch! Those little bagels are the perfect size to pick up with your hands! These would be a great addition to a brunch menu. Mmmmm! The perfect two bite salad (I take big bites obviously, lol!). I think this looks so yummy and a little more substantial than just a regular salad, YUM!